With the deteriorating quality of air quality in the Indian cities these days, time is not far when air purifiers will become a necessity item in every household. An air purifier is a device to filter out pollutants like dust, cigarette smoke, bacteria, PM 2.5 in the most basic models to harmful gases and ultrafine particles like allergens. While the usage of air purifier does not guarantee a betterment in health, there have been concerns that release of ions and ozone in certain brands can do more harm. The rising level of pollution and heavy urbanization has led to sharp levels of air pollution, which has been the cause of many respiratory disorders in adults and especially in children. It is said that Bangalore’s air is as toxic as smoking six cigarettes a day, while Delhi air equals to 20 cigarettes a day. 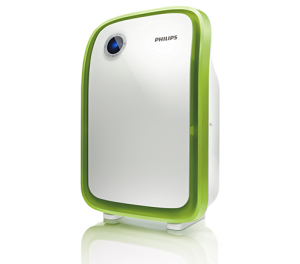 I myself have started feeling the importance of having one at home and thus am writing about Philips Air purifiers for the benefit of readers. Different models offer different combination of features and hence the price varies between Rs.16,000 – Rs. 50,000. All Philips air purifiers come with a HEPA filter. 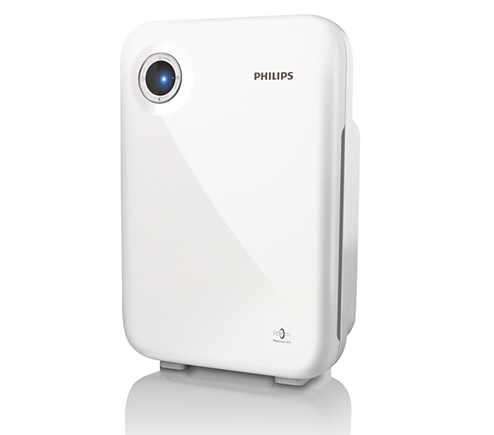 If you suffer from asthma or another breathing difficulty, you may find a HEPA air purifier helpful. Its activated carbon filter is also helpful as the heat used in the process of changing carbon to an “activated” state drives out impurities. In air purifiers, the activated carbon is often combined with other minerals which helps in filtration. Philips also uses VitaShield Intelligent Purification System which is a high-performance air purification technology that combines HEPA (high-efficiency particulate arrestance) and activated carbon filters to reduce the effects of air pollution at home. 1) AC4025/10 is the most basic model with 2 step filtration – activated carbon (AC4103) filter, which filters through bigger particles like human hair and regular house dust, and effectively removes odors and harmful gases and second is the HEPA filter (AC4104) filters out fine dust, bacteria and allergens. However, these filters need to be replaced from time to time. The company needs to make sure that these filters are available also in Tier2 cities in India, to support a seamless customer satisfaction. It operates very quietly and dimmed lights. There is an alert to replace the filter, otherwise the appliance stops functioning. You can set timer for 1/4/8 hours, after which it automatically switches off and also has a 3-step fan speed that lets you adjust air flow. Noise level – 36 (Sleep) – 54 (Highest speed) dB. Available for Rs. 16,995 at Philips, or you can buy at a discount on Amazon. 2) AC4012/10 – Filters out Ultrafine particles, allergens, bacteria and viruses with size > 0.02 micron through VitaShield Intelligent Purification System. 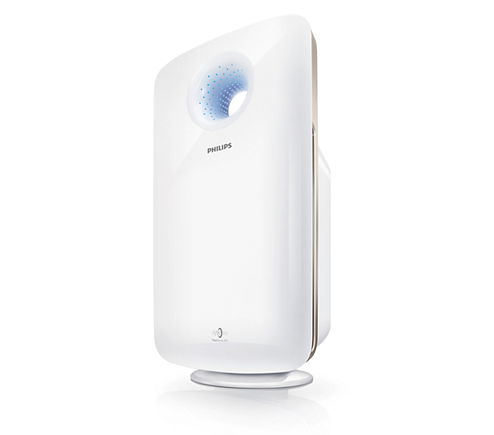 Other features include smart sensor which detects the quality of air, sleep mode that operates silently in dimmed lights, 3-step fan speed setting, 1/4/8 hours timer setup, healthy air protect lock that shuts the appliance down until the filters are replaced and a 3-step light indicator showing how clear the air quality level is – blue is for good, purple means fair and red is bad. Filters that need replacement are AC filter (AC4123) and HEPA filter (AC4124). Available for Rs. 19,995 at Philips or you can buy at a discounted price on Amazon. 3) AC4014/10 – This product comes with Vitashield Intelligent purification system. Like the above product it comes with 3-step fan speed adjustment, 1/4/8 hours timer and an alert to replace filters. However, the most striking feature is its VitaShield IPS, which filters out pollutants like ultrafine particles, allergens, bacteria and viruses with size >0.02 Microns. It also has a 3-step light indicator. Like the above product, the filters (AC filter – AC4143 and HEPA filter – AC4144) need to be replaced from time to time for AC4014/10 too. Available for Rs. 28,995 at Philips or you can buy on Amazon at a discounted price. 4) AC4072/11 – This product is again an upgradation from the previous version. It comes with German multi-layer filtration technology, alongwith Philips’ VitaShield IPS and purifies pollutants like fine dust, pollen, allergens, bacteria and viruses and harmful gases like formaldehyde, toluene and TVOCs etc. This German multi-layer filter contains layers of HEPA and specially treated activated carbon. It also comes with an additional healthy air protect lock, in addition to healthy air protect alert (similar to the above two models). This lock ensures the appliance stops operating, when the filters are not replaced. However I think it does not make much sense, since the alert has similar a function too. Another interesting feature is the night mode, which is designed to conserve power. The appliance automatically switches to Night mode when the room becomes dark – the fan speed and noise level are reduced. There is an auto control mode, which automatically switches off the appliance if the air is clean. It has a fully automatic operation and comes with a 5-step fan speed adjustment. You need to replace its Formaldehyde filter (AC4147) to ensure smooth functioning. Similar to the previous model this version too comes with light indicators, but in this case it’s a 4-step indicator to show the air quality – blue is very good, deep purple is good, purple is fair and red is bad. Available for Rs. 39,995 at Philips or you can buy at a discount on Amazon. 5) AC4372 – Vitashield IPS professional filtration system to filter out harmful gases like formaldehyde, toluene and TVOC etc. and pollutants like ultrafine particles, allergens, bacteria and viruses with a size of >0.02 micron. Other features include smart sensor, healthy air protect alert/ lock, Child lock, 4-step LED indicators, light sensor, auto mode, 6-step fan setting, 1/4/8 hours timer. The different filters that need replacement are AC filter (AC4153), HEPA filter (AC4154) and Multi-care filter (AC4151). Available for Rs. 49,995 at Philips or you can buy at Amazon.